Any adventurous home aquarium owner will tell you how fun and exciting it is to have a reef tank. Breathtaking underwater scene, colorful corals and playful betas – it’s everything you’d want your home’s centerpiece to be. However, keeping a saltwater aquarium can indeed be more challenging than a freshwater aquarium. Aside from making sure proper pH of the water is maintained, you also have to make sure the right amount of substances like calcium is present in the water. The survival of captive reef invertebrates in your tank is dependent on how persevering and tenacious you are in maintaining the proper salt mix in the water. It’s not just all about having salty water; it’s about achieving the proper salt mix. So how do you achieve the proper salt mix for your aquarium? Once you decide to keep a reef tank, be prepared to spend more on some gadgets that you will use to test the salinity of the water. This gadget is as important as the tank itself because if you’re not able to measure the water’s salinity, all your tank creatures will die and you can forget the whole thing. Seriously, it’s important that you are able to constantly check the water salinity so that it doesn’t get any lower than 35. Salinity means the amount of salts dissolved in the water and many reef keepers use the refractometer to accurately measure the amount of dissolved salts in the water. A refractometer evaluates water salinity through refraction of light which can be done even with just a tiny water sample. 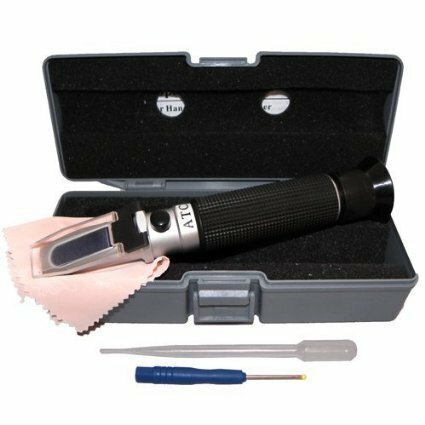 The refractometer can give the precise measurement of salinity and you’ll see the numbers displayed on its small screen. 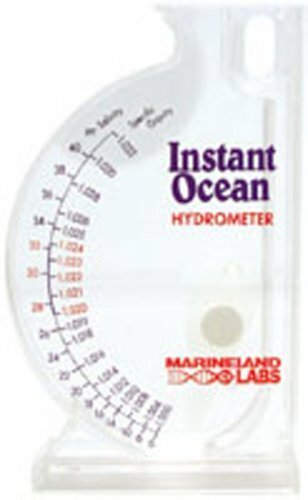 Another more traditional and reliable instrument to use for measuring salinity is the hydrometer which measures the water’s gravity or density. Freshwater weighs 1.000 grams per liter, and when the salt mix is added to it, the salinity should increase the water’s density to not more than 1.025. So that makes it easier for you to know if your tank has just the right salt mix enough for the corals, the fish and all the sea creatures to stay alive and healthy. Now you’re ready to make the right salt mix for your tank. Remember that salt mix is the most convenient and easiest source for your reef aquarium. It is also the healthiest (debatable) because you have the additional calcium and other substances your water creatures need to stay alive and active. Take note that even if you have sea water in your tank, that is ten thousand times different from the real one because in the ocean, whenever water evaporates and substances that make the underwater creatures alive become depleted, it is easily replaced. In contrast, in the home aquarium, dissolved substances can become severely depleted in between water changes or during hot weather when water evaporates faster than ordinary days. So you must always test the salinity of the water to prevent any more damage to your tank’s inhabitants. The salt mix that can be bought from your local pet store is an imitation of ocean water, which means the substances that makes the ocean a healthy environment is present in the salt mix. It is not table salt or sodium chloride but a mixture of different types of salt. Follow the directions indicated on the label of the salt mix but keep in mind that the manufacturer’s directions is not the exact measurements but only approximate the ideal value. You need to check the water for proper salinity to know if you have put in just enough salt mix. Add more salt mix or add fresh water to adjust the salinity. Before you measure the salinity using either a refractometer or hydrometer, check if the salt is completely dissolved in the water. To achieve the proper salt mix, use distilled water or RO water, for your tank. This is the only way you can be sure no unwanted substances is polluting your water. You can then be assured that you get the proper makeup of the salt mix. Don’t pour the salt directly into the aquarium. Better to dissolve the salt mix in a bucket of water before you pour it into the tank. Now that you’re done with getting the correct salt mix and achieving the ideal salinity, the next thing to do is to maintain that ideal salinity. That takes patience because, in the first place, whenever water evaporates, it leaves the salt and substances in the tank. This will result to increased salinity and if that happens, your tank will no longer be an ideal reef environment, and you will soon see your fish and corals weaken and eventually die. The best way to ensure your tank has the appropriate salinity is by ‘topping off. This is done by replacing the evaporated water with fresh water to maintain the ideal salinity of the water. Make sure you use distilled water or reverse osmosis water to add to the tank water. To know how much water you should add to the tank, use a marker to indicate the original water level. That will be your reference when adding the distilled water. If necessary, you can add the salt mix as directed. Don’t forget to measure the salinity of the water as you add either fresh water or salt mix to the tank. As we always say, patience is the only way to successful aquarium-keeping. When you see the results of your effort and gets to enjoy your tank as the centerpiece of your home, you’ll know it’s all worth it. Did you find this post useful? If so, please share it with your friends via your preferred social media channels. Still have questions or additional tips to share? Post it in the comments section below.